As part of Dukanes Classroom and Conference Room Series, the 8950WU combines WUXGA 1920 x 1200 resolution with super-bright 5,000 ANSI lumens white/color light output for a stunning visual achievement. It can transform classrooms, lecture halls, and auditoriums into true learning centers. Incorporating Dukane's leading-edge technology, the 8950WU features an image-enhancing combination of Accentualizer, High Dynamic Contrast Range (HDCR2) and Image Optimizer, all of which contribute to the overall visual experience. Moderator Control Mode allows up to 50 computers to connect to the projector and the moderator can choose which images to show on screen. With the multi projector feature the same image can be projected on up to 12 projectors simultaneously. 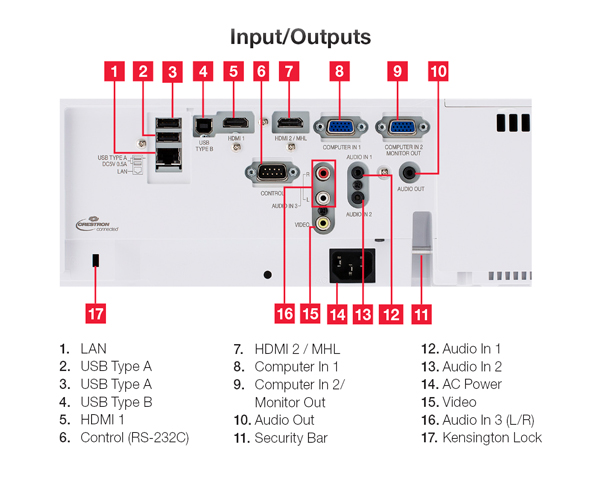 The 8950WU also includes our iOS application Projector Quick Connection App which offers simple control options including sending photo and document files and web site contents to the projector. For added peace of mind, Dukanes 8950WU is also backed by a generous warranty and our world-class service and support programs.